The registration for the Foundation to Natural Perfumery Course closes on February 29th. The course is available for both local and long-distance students. You can now pay online to reserve your spot. We ask that you sign up no later than February 29th, so that we can make sure there are enough copies of the course handbook for everybody! The course curriculum and an outline of the book's table of content can be viewed here. For any additional information, contact me directly. 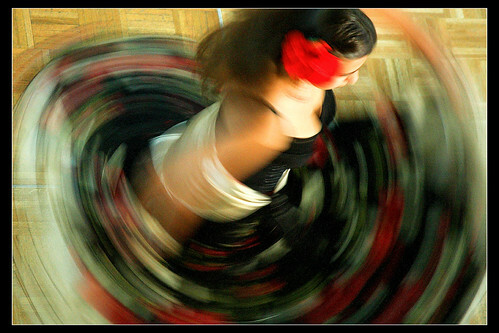 Flamenco Dancer, originally uploaded by CameraOne. The carnations that are used for perfumery, however, much like the wild carnations, are far more modest looking with only one tier of 5 petals. They are either pink or white in colour, and their edges are, as in all carnations, pinked – which is the true reason for their name “pinks” (in this case, the name has no connection to the colour). These small flowers are very fragrant, with the main constituent responsible for their sweet and spicy aroma being eugenol. The same spice present in high doses in clove buds, as well as in allspice berry. The idea for a carnation soliflore was cooking in my head for a long time. In 2001, I have created a perfume called Altamira, the name chosen because of utter fondness of Steely Dan’s song and the concept was built on what I associated with these prehistoric caves in Spain where the first fresco were discovered. In a connotation that now seems to be everything but original, I have paired notes of carnation (chosen for the association of Spain, Flamenco and carnations) with sweet animalic base notes dominated by costus, which turned out fantastic even though a bit quirky and peculiar (costus will add peculiarity to any perfume with its animalic sensuality). Once I have discovered that costus should not be used on the skin, I had to neglect the idea of letting anyone but myself use my Altamira perfume. I have used carnation in several perfumes – a feminine version for l’Herbe Rouge (which was never really added to the collection; it was very similar to the l’Herbe Rouge you know, but with more carnation at the heart); and of course my first perfume, Ayala, which has a dominant clove and carnation note at the heart in addition to the other floral notes. Once the Altamira perfume had to be neglected, I came up with the idea of the name InCarnatnion, for a soliflore perfume. It wasn’t until 2006 though that I have seriously started to flesh out the concept and think about it in the context of my soliflore collection – The Language of Flowers. This collection is a study of individual floral notes, some of which classic themes for soliflores (i.e. : rose, violet, lavender, and of course, carnation), and others are a bit more unusual (i.e. : osmanthus, magnolia, linden blossom…). While the concept for The Language of Flowers is that of simplicity and minimalism, it is not to say that all of the perfumes are all that simple… Some notes require a complex backdrop for them to truly shine. And InCarnation is one of those scents, where the formula is complex and hides in it more than would be apparent to the unsuspecting nose… And when I have found a carnation absolute that I liked, it was time to start working… This carnation absolute from Egypt performed like a carnation blossom upon dilution – as if the alcohol opened its mysteriously spicy and green buds and allowed them to bloom fully. For the first time, I’ve used the animal material called “Africa Stone Tincture”. The name is deceiving and confusing – while it does come from Africa, this is not really a stone. Rather, it is a nice perfumey name for the dropping of the rock hyrax, a relative of the elephant that releases large doses of pheromones into its droppings in order to communicate with other hyraxes. The scent is leathery and animalic (think both indolic and uric at once, and with that dry leathery undertone – hence it is most commonly described as a cross between civet and castoreum, which is a pretty good description if you ask me). Unlike the latter, hyraceum (AKA Africa stone tincture) was obtained by neither killing the animal nor torturing it – but rather by a meticulous and careful, albeit innocently odd and obsessive – collection of the animal droppings from nature without disturbing it from its peaceful life. While I can’t say I like hyraceum nearly as much as costus, it does add to InCarnation that animalic undertone I was hoping for – while fixing the floral notes quite nicely. I can’t say that I have replicated the fresh flower’s aroma; nor can I pretend that it reached any near previous carnation masterpieces (Bellodgia and Poivre by Caron being the most significant of all in my opinion)… But I’m happy with it and I have enjoyed tremendously the paths that lead me to create it. InCarnation can be made in both parfum extrait $110 and crème parfum. The crème parfum is contained in Ayala Moriel’s signature pendant $150, collectible poison rings (price ranges) $55-$100), or the vintage pillbox with carnation print $130 (pictured below). These nights, I’m haunted by dreams of aviation. Flying small primitive aircrafts of not-particularly functional structure; descending overtop clouds, green lands and fields of ice stretch beneath me; arriving at unknown continents in unpredictable timing. Perhaps this is what brought me to pull out the sample of En Avion I had buried for quite some time. I have never quite given it a try for a prolonged period of time. Perhaps it is my love affair with Vol de Nuit that prevented me to really experience En Avion until now. It’s as if there is room only for one aviation perfume at a time. And of course there is the mythological Amelia Earhart (1897-1837), the first woman to fly across the Atlantic in 1928 (and the second to fly it solor after Maryse Bastie), and who disappeared in her flight above the Atlantic but despite her many other accomplishments as a aviatrice, she’s most famous for her mysterious disappearance towards the end of her flight around the world. She disappeared somewhere in the Pacific Ocean, between Lae, New Guinea and Howland Island – the destination Amelia never reached. Of course, this lead to many conspiracy theories, most of which rely on a firm belief that Amelia was in fact a spy, who’s disappearance was either staged by Roosevalt’s administration as to not jeopardize her operation; or, alternatively, was in fact caught by the Japanese while on her espionage mission. So what’s with that and perfume you ask? Well, in the first decades of aviation, when we were all blinded by the glare of heroism and miraculous ascent of human spirit above the clouds, defying gravity and other enemies – aviation has inspired art – including books (Antoine de Saint Exupéry, an aviator, spy and an author, has written several books inspired by the topic). And lastly there are two grand perfumes inspired by aviation – En Avion (Ernest Daltroff, 1932), dedicated to the pioneer female aviators mentioned above – Bolland, Boucher and Bastié; and the infamous Vol de Nuit (Jacques Guerlain, 1933), inspired by the book of the same name by the abovementioned aviator-author, which I have already reviewed on this humble blog. En Avion opens dark, like all Caron extraits, and with a certain bittersweetness that does remind me somewhat of Vol de Nuit (though I have to admit, the only reason I compare the two is because of their common theme). While Vol de Nuit is green and sharp, herbaceous at first – En Avion starts off more spicy and floral. Carnation is apparent immediately, but so is orange flower, which smells like an echo of l’Heure Bleue with pilot-hat and goggles… Although Vol de Nuit has the signature powderiness from the classic Guerlinade and iris notes engrained within its structure; En Avion takes powderiness nearly into central stage, and in a far softer and lady-like olfactory context: rose, lilac and violet, and underlined with powdery opoponaxs which almost instantly bring to mind the scent of vintage face powder. As for the base of En Avion, it is redolent of Atlas cedarwood with its suave, polished olfactory-texture, a bittersweetness of tonka bean (again, a reminder of of Vol de Nuit; but let’s not forget that En Avion preceded Vol de Nuit’s launch by a year…). There is, however, a subtle presence of burnished leather at the base, however it is not as animalic or leathery as other Caron creations (i.e. : Narcisse Noir, Tabac Blond), it is almost as soft as suede… If Vol de Nuit is a wild, ambitious woman with restrained emotions and top-notch professionalism; En Avion is not any less ambitious woman that secretly displays her femininity even when boarding an airplane for what might be her last flight ever… Underneath the pilot jumper, she is still wearing silk stockings and laced lingerie. To that I would add that in the top notes I can smell orange blossom rather than neroli (there is a different between the two! ), I can't say I'm particularly smelling orange (there is a citrusy freshness, but it is well hidden with all the additional dense notes); and there is definitely a dry allspice note weaved in, as well as cloves and perhaps even a hint of nutmeg. While I can't say I smell much of the lilac (I would have to go back to it once I'm fully recovered from my cold though...), violet and rose have a strong presence, and so is the carnation. The base is neither particularly musky nor ambery; but there is certainly the animalic powderiness of opoponax weaved into a dry tobacco-leather base that might include castoerum, and the woods in question are the beautiful Moroccan cedarwood from the Atlas mountains. Intimacy, originally uploaded by Ayala Moriel. After washing your face with warm water (or warm water and salt or castile soap, if you prefer...), tone your skin with a pure floral hydrosol. Use orange flower water if you have an oily or acne prone skin. Use rosewater or rosewater mixed with vegetable-glycerine. If you have a sensitive skin, use a mister to apply to the face. Otherwise, you can use a cotton ball or cosmetic pad. Best used before bedtime, for dry to normal skin. Apply after toning your skin with hydrosol. - Essential oils of your choice that are beneficial for your skin type. i.e. : neroli (for normal to oily skin), rose and carrot seed oil (for mature skin), chamomile (for sensitive skin). Is it possible that Lee Myung-Bak victory in the presidential elections for South Korea rely on perfume? Reuters reports that a custom scent named "Great Korea" was secretly spread in the crowd around Lee Myung-Bak during his election campaign, with the sole purpose to remind the voters of the same scent later near the ballots of the same fragrance (secretly, of course). Thankfully, Canadians need not to fear of such electorial manipulation in their vast country; their capital city Ottawa is one of the leading cities in the world for anti-scent legislation. If you ever wondered why, you got your answer now. The relationship between an artist and his muse is as complex as the relationship between lovers. And a very unequal relationship at that… The play of distant admiration and intimate knowledge; nurture versus complete oblivion; give and take, rejection, acceptance… The muse, unreliable and fickle, and like a true diva, wants to be worshipped and taken care of with nothing in return, except for providing inspiration… Sounds almost like an abusive relationship, and well, it might as well be if the artist gives the muse more importance than she deserves. If he thinks his livelihood is dependant on her… The artist has to acknowledge that the muse is part of him. Part of his art. And it is the unpredictability from within, that unknown well of consciousness, connected to the far deeper conscious of the universe, that inspiration may spring. As far as real-life muses go, my experience with them has mostly been that they are ungrateful for the most part… Perhaps being a muse makes the human ego explode to unmanageable proportions... Perhaps I just had bad experience… It might have been my dream all along to be a muse myself; a dream I have fortunately neglected as it is even more frustrating to engage in such a complex relationship with a mortal man than with a mythical, muse. Perfumer Neil Morris, however, seem to have lucked in that field and have found himself a real, flesh-and-blood muse that loves him as well as the creations she inspired in him – enough to even promote them herself… The package from Ida Meister (AKA Chaya Ruchama) came in the mail unexpectedly, and I opened it in the post office, a bit at awe to have found out I received a kiss in the mail… Only than did I look at the name of the sender on the parcel and it made perfect sense. Chaya Ruchama has come trough as a passionate and warm lady online, and I hear her correspondence is not where her warmth ends. Also, today is the LAST DAY to order your Signature Perfume for the "old" price before the price goes up. As of tomorrow, the price will increase to $550. I wish you all a very lovely evening! Tangier, Morocco: spice merchant (v.2), originally uploaded by shadowplay. Today being Valentine’s Day, and me being equally tired of talking chocolate and being quite oblivious to the significant day (well, when we have Valentine, we should celebrate our love everyday; and for those of us who don’t have one, why rubbing it in our faces and flaunting dozens of roses and red lingerie in our faces?!) – I have decided to dedicate today’s post to one of my favourite topics of all – the seduction of the kitchen, cooking with spices and enjoying every moment of it. Whether if you cook for yourself, for your Valentine or for your family, the experience of cooking, in my opinion, seduces all the senses and invites us to enjoy the simplest things in life – and the most precious and important ones. We tend to confuse love with passion and passion with libido… And so, many love potions are indeed nothing more than libido-enhancing concoctions, AKA aphrodisiacs. 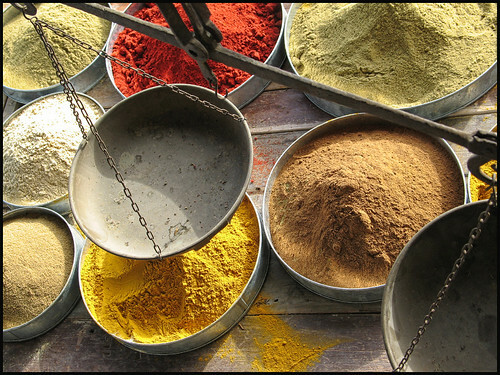 Interestingly enough, the origins of Ras el Hanout, the Morrocan spice mixture that is infamous for its complexity and the creativity it allows for – was as an aphrodisiac. Concocted by skillful spice vendors or market magicians, Ras el Hanout was a display of the store’s most precious ingredients (hence the name, which literally translates to “top of the shop”). The spices are first dry-roasted in a cast iron pan to bring out their flavours. Roast each spice separately, as they will require different lengths of exposure to heat. Once roasted, grind them manually in a mortar and pestle for best results. Either a marble or a copper one is best for achieving a fine powder. I have prepared this exquisite Ras el Hanout with one of my aromatic cooking classes, using freshly grated galangal, ginger and turmeric roots (available only through specialty stores such as the Southern Seas Trading Co. in Granville Island), but needless to say the dried version would be exquisite, as long as the roots are freshly ground, rather than those stale powders found in supermarket’s jars. The proportions are only a suggestion. I think this is part of personalizing the recipe, and you may want to adjust the mixture while cooking. Depending on the dish you are using the recipe for, you may want to accentuate a certain spice, add a few more or even eliminate some. This recipe was made with a couscous vegetable stew in mind – one rich with orange coloured vegetables (carrot, yam, pumpkin, butternut squash…), celery and coriander. It would make a perfect accompaniment to lamb stew as well, resulting in a seductive, festive couscous feast. Roast the spices separately (except for the already ground spices, the rose petals, lavender buds and ambrette seeds). Grind, measure and mix. Use the Ras el Hanout to top-off rice or couscous, and of course - in soups and stews. This can also be used as a rub for meat and poultry before broiling or baking. I'll leave the rest to your imagination. Below I included my recipe for a couscous stew. You may use packaged couscous although I do not recommend it... If you are in a particularly labourous mood, you may also prepare the couscous itself from scratch. It is not as difficult as it may sound, but explaining it in writing is a lot more difficult than demonstrating the process... So I've only included the stew recipe for now. The vegetables in a couscous stew are always cut into very, very lage pieces, and in some cases are even cooked whole. Use any vegetables that are in season. Couscous goes really well with everything, as it is rather neutral in flavour and absorbs all flavours it is served with. The following recipe is a classic Morrocan vegetarian couscous stew, very similar to the one my grandmother used to make for us. - Prepare the vegetables as instructed above. - Sauté the onions in the olive oil. - Add the water or soup stock – fill the pot only halfway through, or no more than ¾ high. - Cook on high heat until water is boiling, and than lower down to medium heat and continue to simmer until the vegetables are soft. - Add the tomatoes and cilantro, and continue cooking until the tomatoes and cilantro are cooked as well. - Adjust seasoning to taste. Associated Content - The People's Media Company run a feature about custom scents for Valentine's Day mentions Ayala Moriel's Signature Perfumes in the very beginning. truffles, originally uploaded by chocolate monster mel. The other flavour is lavender and nutmeg, which are milk chocolate base. Both are made with fresh organic whipping cream and were hand rolled by myeslf and dusted with Dutch cocoa powder. 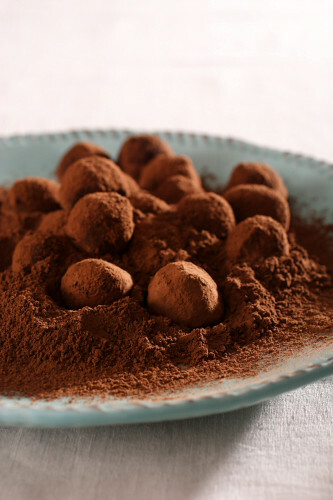 I'm now offering them on the website in the box size (8-10 truffles a box, for $12). More flavours can be made upon request. Tirzah Tea Time, originally uploaded by Ayala Moriel. Escaping the wet snow outside, I entered Dawna’s cozy apothecary-kitchen. The table was already set with a bamboo tea tray and a glass plate laden with linden and tiny orange-almond cookies. Through the kitchen window, embraced with a yellow curtain, we could still see the snow falling straight to the ground, uninterrupted by wind. Tea time with Dawna is always special. And when there is a new tea-blend involved, even more so. 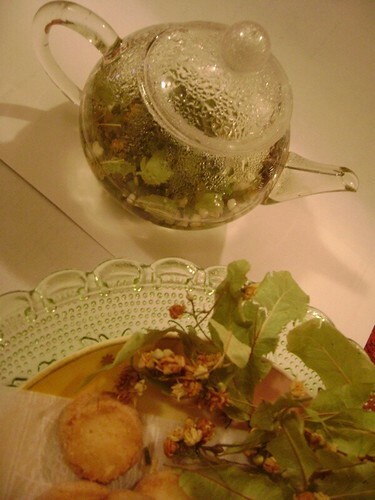 This time, the occasion was our shared tea-tasting ceremony of Tirzah – the new perfumed tea blend Dawna have created to accompany my linden blossom soliflore. Back in June 2007, when Tirzah was lauched, Dawna has created a limited edition blend of one tin only which she named Flora Linden (which is now available as a limited edition tea directly from Inner Alchemy Tea Co.) . It was lovely and floral, but we felt that it was time to re-visit this concept and re-create a tea that is more representative of Tirzah’s woody-floral-green freshness. Dawna surprised me with orange-almond cookies that were made by Elsa’s Story in no other place in the world but Nahariya – a beautiful beach city which happens to be the nearest to my village in the Western Galilee… She also surprised me with some ideas for our next tea collaboration: a yerbamate-based tea blend to accompany Gaucho (to be released in Spring 2008). The beautiful dried herbs she showed me all resonate deeply with the green yet sweet coumarin qualities of Gaucho… Aside from peaking your curiousity, I will say no more. The tea was than strained and a pure, light green liquid was poured into the delicate clear-glass tea cups. While we waited until the tea cooled down a bit in the cups (which brings out the flavours better), we enjoyed smelling the gentle steam emanating from the cups and marveling at the connection between the tea and the perfume that inspired it. Both have a delicate, lemon-woody-floral feel to them. The greenness is spring like and fresh, and delicate and gentle rather than brash and sharp as greens can often come across. The tea is very pure and delicately smooth on the palate. Tirzah has a unique floral bouquet, interlacing linden blossoms and leaves, hops flowers and the honeyed, fruity-apricotness of osmanthus blossoms. While the lemon peel has a definite presence in the immediate experience of the tea, it is more floral and woody than being remotely similar to a lemonade… And the sencha leaves (two different kind of organic green Japanese sencha tea leaves were used) create a sophisticated, delicately-green, smooth and only ever so slightly tannin backdrop to this tea-tapestry. Tirzah tea is perfect and pure and should be served with no additional sweeteners that will mask the subtle complexity of its floral notes. Though I might add that the orange and almond cookes served on the side were fantastic, they are by no means necessary for enjoying this beautiful tea. Tirzah perfumed tea is a delicate floral blend based in organic Japanese sencha green tea. Ingredietns: Organic Japanese sencha tea leaf, Wild Linden Blossom Wild Linden Leaf, Organic Lemon Verbena Leaf, Organic Lemon Peel, Wild Osmantus Blossom, Organic Hops Blossoms. All botanicals are guaranteed certified organic or wildcrafted in a pristine environment and tested for chemical residues. Each tin contains 50gr of loose leaf tea. To prepare: bring water to a boil. Wait a few moments before steeping the tea leaves. Steep 1-1/2 teaspoons in 8oz of boiled water, for 1 minute (if you prefer a stronger tea, you may steep it for 1-1/2 minutes, but no more than 2 minutes to prevent the tea from becoming bitter). Tirzah tea is best served unsweetened, and its flavour improves even more when it cools down to room temperature. It is an excellent meditation tea as well as a light rejuvenating tea to be enjoyed throughout the day. We are now pleased to offer Tirzah for an introductory price of $20 (regular price is $30), when you order it along with Tirzah perfume as part of our Tea Time Gift Set. Blunda Aromatics in Los Angeles has now added the Ayala Moriel line to their online store. The selected fragrances at Blunda are all jojoba oil based, in the highest concentration available, in the beautiful frosted glass flacons. Visit Blunda to buy any of the following fragrances in oil form. Click on the perfume name to order it from Blunda for a very attractive price and an additional 10% off!